WWJD? 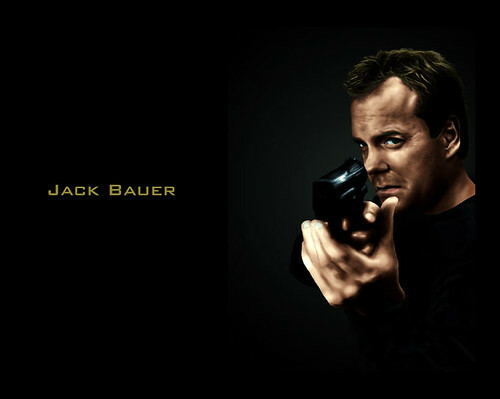 : What Would Jack (Bauer) Do? Her time runs out and the computer automatically logs her off, as expected, before I can even touch the keyboard. She, of course, blames the librarians. Oh, and did I mention that the computer system has built in time prompts that pop-up in a BIG yellow box on the user’s screen at 30 minutes, 15 minutes and 5 minutes that warn of the time running out? Geesh. “I’m standing near the new books section, giving the skunk eye to a group of teens when I get that tingling in the back of my neck…something’s wrong. Looking around, I see a 50-something female patron frantically motioning to me over to the computer area. Seeing her distress, I quickly shove a young kid out of my way and dive over two book carts, nearly impaling myself on a book end. Thank god I insist on wearing my bullet-proof vest at work. I do a quick tuck and roll and land at the patron’s feet. When I get there, she is freaking out and yelling, “You have to extend my time! Extend my time! I’m taking a test! I’ll lose everything!” I look at her computer screen and see the time counter is now on 7 seconds (and counting). That’s when I realize, she’s a Chinese agent who is trying to release a computer virus! With my lightening reflexes, I knock her out with a swift karate chop (I’ll torture her later for more information), grab the computer off the desk and run toward the back door. OMG, I am so laughing! Aww, ya’ll are making me blush! Thanks. Please, let us know when your first novel comes out, we want to be first in line.